Let us compare here Chatrang, ancestor of European Chess, and Xiangqi, Chinese Chess. In both games, the goal is to capture the opposing King. Despite these similarities, they are noticeable differences which have to be discussed now. The board in Persia had plain squares. It has been used unchanged by the Arabs. The black and white checkering is an European invention which occurred as soon as the game reached Europe. (The checkering is attested in the Einsiedeln manuscript in 990). 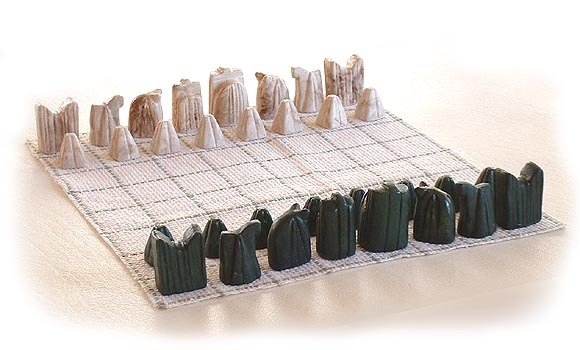 In India, Chess has been played on Ashtapada board. The world means "eight feet" and is attested in Sanskrit texts in relation with games since the 4th or 3th centuries BC (the Buddhist Vinayapitaka) but the only thing that we are sure is that it was for a dice game. Even if we don't know exactly what kind of game was played on Ashatapada board before 600 AD, it is certain that it was popular. (Murray thought that is was similar to several spiral race game played in India on different board size (5x5, 7x7, 9x9), but there is no evidence). The adoption of the 8x8 board was probably due to this popularity. Concerning "war games", following Murray's classification, it is agreed among game historians that this category first occurred in Greece with games like Pettiae or Polis. The Romans continued with Latrunculi. The exact rules of these games are, unfortunately, badly knows. An agreed point is the custodian capture : a man was taken when sandwiched between 2 enemy pieces. Another one was the use of the square for playing, not the intersections like in more recent Alquerque, the Draughts ancestor. Succeeding the huge Alexander's empire, the Hellenistic states continued for a long time their influence in Bactria, Persia and North-West of India. For instance, Menander (160-140 BC. ), Greek king of Kabul, enlarged his kingdom up to Pataliputra on the Ganges and changed his name to Melinda. One century later, the coins still represented both Zeus and Buddha and the kings were getting the double title of Basileus (like in Byzance !) and Maharadja ! It is very likely that Chess, another war game, is played over squares because of the Hellenistic cultural influence over these regions. In China, the most popular games before the appearance of Chess were Weiqi and Liubo. Weiqi was adopted by Japanese under the name of Go and it is under this name that it became one of the most strategic games of the World. Liubo is an extinct game and it remains very mysterious. 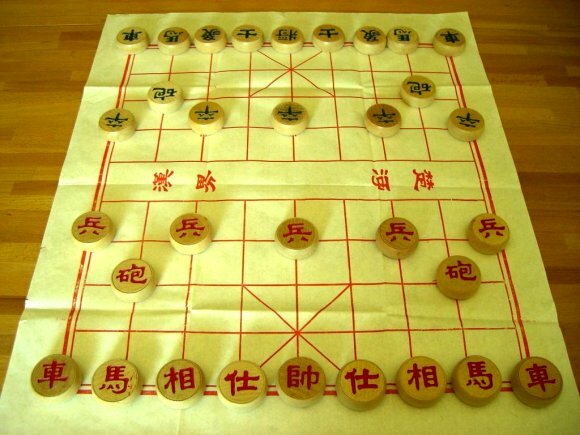 Weiqi is played on intersections, and it is possible that this fact influenced the ancient Chinese to play their Chess. Liubo used an heavily marked board and it is possible that this indicates a relation with Xiangqi. For instance, there is a central square on the Liubo board. Is there a mere coincidence that there is a river in the center of the Xiangqi board? The number of pieces is identical in both games which is a strong indication of a kinship. However, there is no equilibrium between major and minor (Soldiers) pieces in the eastern variety. Moreover, there are 5 and not 4 categories of major pieces in Xiangqi : the Cannon has no equivalent in western chess. The Cannons : moves and captures othogonally. Moves like a Chariot, captures by leaping over a third piece. The King, or its equivalent, has less mobility in the Chinese form. This is also true for the Advisor/Vizier, the Ministers/Elephants and the Horses. Eastern Chess then looks like a blockade game where the pieces are besieging a confined King. It is completely different in the western Chess where the King is unbound and really leads the operations on the battlefield. Pawns (Soldiers) are similar because they go 1 step ahead but their capture mode and their promotion are very different. That makes the biggest difference on the structure of the two games. In the eastern Chess, with their increasing of power when they cross the river, they have a very active role in besieging the fortress. The western Chess looks more like a subtle mix between a war game and a race game : within the battle, the Pawns are racing to the last row to get their promotion to an officer. Use of carved pieces have been chosen in Central Asia and India where China preferred the use of tokens bearing the name of the piece with an ideogram. Une rangée de Pions en première ligne. Un Éléphant à côté de chaque Cheval. Pour les deux jeux, le but est la prise de la pièce "royale" adverse. Le jeu indo-persan se joue sur les cases d'un échiquier de 8 x 8 cases alors que le jeu chinois se pratique sur les intersections d'un échiquier rectangulaire de 9 x 10 positions. Les Pions sont cousins car ils avancent d'une seule case mais leur mode de capture et de promotion sont très différents. De plus, ils sont en nombre plus limité dans la version orientale. Le Roi ou son équivalent est de mobilité plus réduite dans la forme chinoise. Dans une moindre mesure, c'est aussi vrai pour l'Adjudant / Vizir, les Ministres / Éléphants et les Chevaux. C'est plutôt l'emploi de figurines sculptées qui a prévalu en Asie Centrale et en Inde alors que la Chine a préféré l'emploi de jetons comportant l'idéogramme du nom de la pièce.